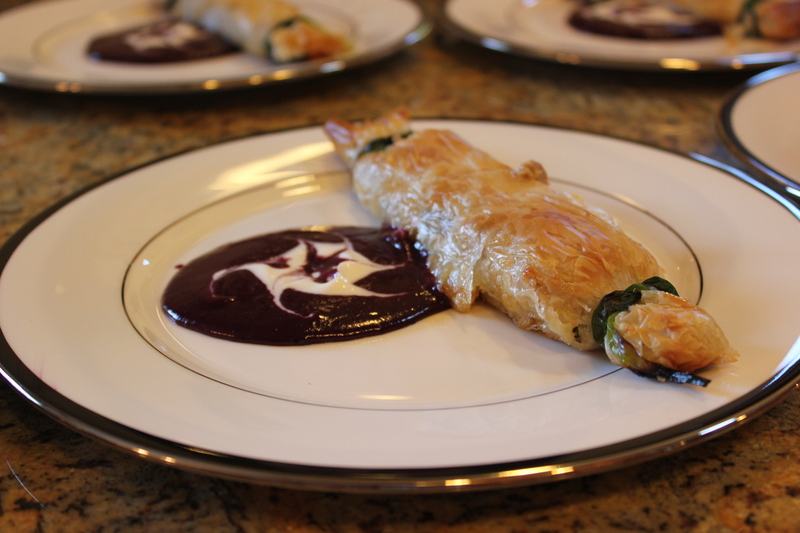 I made this for a client in my personal chef business when she requested “I’d like something with smoked duck, and blueberries.” This strudel is crispy on the outside, and has a creamy salty flavor from the cheese on the inside. The blueberries give the duck a sweet/tart taste. And because Pinot Noir has fruity notes, I added it to the blueberry sauce. The combination turned out great, so now it’s one of my favorites to cook as a first course. And what makes this a time saver is the sauce can be made the day ahead and re-heated, and the filling can also be cooked the day ahead and wrapped in the fillo just before baking. I made this for a client in my personal chef business when she requested "I'd like something with smoked duck, and blueberries." This strudel is crispy on the outside, and has a creamy salty flavor from the cheese on the inside. The blueberries give the duck a sweet/tart taste. And because Pinot Noir has fruity notes, I added it to the blueberry sauce. The combination turned out great, so now it's one of my favorites to cook as a first course. And what makes this a time saver is the sauce can be made the day ahead and re-heated, and the filling can also be cooked the day ahead and wrapped in the fillo just before baking. Heat butter in a large frying pan and add shallots, and sauté 2 minutes over medium heat. Add the mushrooms, fresh thyme leaves and persimmon (or plums) and sauté 2 minutes. Add the cognac (or brandy) and 1 cup heavy cream and heat for 2 minutes. Remove the pan and add the cheese and shredded duck meat, season to taste, and cool completely. In a sauce pot, over medium heat, combine the blueberries, pinot noir wine, water, sugar and thyme sprigs, and bring to a light simmer for about 7 minutes. Mix the 2 tbs. heavy cream with 1 tbs. cornstarch to make a slurry. Add the slurry to the pinot noir blueberry sauce and stir until thickened. *Refrigerate if making the day ahead. Re-heat the blueberry sauce over medium heat (if refrigerated overnight), and add the butter to give the sauce shine. Bring a pot of water to a boil and add the scallion greens and blanch for 30 seconds. Stop the cooking process by shocking the greens in a bowl of ice water. Remove the scallion greens and gently squeeze out the water (make sure all the water is squeezed out so it doesn't make the fillo dough soggy). Set the scallion greens aside. Bring the duck filling to room temperature. Portion out the filling into 6 portions and set them aside. Melt the 6 tbs. butter in a cup. Lay 1 sheet fillo dough on a large cookie sheet (cover the remaining sheets with a damp cloth to keep it from drying out). Lightly brush the fillo dough with the melted butter and a basting brush. Place one portion of the filling into the center of the fillo dough at the end closest to you. Roll the fillo dough with the filling inside the whole way to the end. ***Tie each end with a scallion (omit this step if not using the scallions), otherwise just fold under the ends. Continue until all 6 strudel are made. Pre-heat the oven to 400 degrees, and lightly grease a baking sheet. Place the strudels onto the baking sheet and bake in the oven until golden brown, about 10-15 minutes. Bring the sour cream to room temperature and add the 3 tbs. heavy cream and mix to loosen the sour cream. Pour some warmed blueberry sauce into the center of the plate. Spoon a tbs. sour cream mixture into a small dollop in the center of the blueberry sauce. Swirl the sour cream to create a design in the sauce. Top with a warm strudel. The filling can be made 24 hours ahead, and brought to room temp before using. The sauce can also be made 24 hours ahead and gently re-warmed over medium heat and the butter incorporated just before serving. ***The scallion ties can be omitted, since they are for decorative purpose only.